Order issued Tuesday 12th December. 1944. 1. You will proceed by military aircraft (ATC) on or about 15 December 1944 from present station to SUPREME HQ, ARMY AG-TM G1, SUPREME HQ AEF, and on completion thereof return to present station. 2. Travel by military aircraft is directed. Baggage allowance to sixty five (65) pounds. Twinwood airfield. Friday 15th December. All flights grounded due to poor weather and visibilty. 1500 ft ceiling estimated. Major Glenn Miller, Lieutenant Norman Don Haynes (bands manager), Lieutenant Colonel Norman F. Baesselle arrive at Twinwood airfield. Miller and Baesselle board waiting Noorduyn UC-64A Norseman piloted by flight officer John R.S. Morgan. Aircraft takes off at 1.55 pm. No radio contact received. There is much claimed on how Glenn Miller was lost. The temperature at 1400hrs was 38.0°, wet and low fog, cloud base was at 150ft with wind at 5mph from ESE direction. Miller's s/n was 0-505273. Other documented information would indicate that the tower was not operational at 1355hrs. Only the communications room was in use. As is documented there was no flight log. There is a military document that states that he was cleared for take off from Abbots Ripton. That might be in error. I have never found any documents showing the Norseman being tracked by radar over the English Channel and I have never found any photographs of the plane showing it's S/N number (aircrafts serial number). Although it is possible there may be. The theory that Lancaster Bombers had jettisoned their bomb load on the Norseman is extremely fanciful. There were over a thousand planes flying over the North Sea and England between 1230 and 1506 hrs and none reported seeing a Norseman UC-64. The only aircraft to be reported taking a nose dive was a P51 fighter about 60 miles East of Clacton in the North Sea at around 1400hrs. The pilot was 2nd Lt. Lee Russell from the 364th FG. A/C number 44-15557 AAF. This can be found in mission report 750 AAF. Also, historian Roy Nesbit based his theory on a difference in time used by RAF and 8th AAF which is not correct. From Feb.1940 to Oct.1945 the time zone used was BST for both airforces British Summer Time (GMT+1) that would then put Norseman and Lancasters about one hour apart. Roy Nesbit places bombers over channel at 1:43. Millers plane departed airfield at 1:55 having a point of entry over channel about one hour later then claimed by Nesbit. For some reason a 17 year old plane spotter at Woodley was able to see a Norseman at a distance of 3000 yards with a cloud base at around 500 ft and mist when all other aircraft he reported as hearing but not seeing. He also failed to mention hearing 4 squadrons of B-17's passing some 10 miles to his South flying blind between 2000 and 3000 ft from the 306 Bomb Group at 1320hrs trying to find RAF Greenham Common. As far as Twinwood and any other airfields operational on the 15th it tends to seem they were not. At the time of Miller's take off a B-17 with one engine failed was trying to find an airfield to land. The plane was from 401 BG stationed at Beenethorpe. Morgan would not have known any conditions at Twinwood. There is no question that if the tower was operational it would have waved him off to land. The wind was ESE and Morgan took off either runway 9/27 East or 13/29 Southeast not South or Southwest. After all the research it was clear that the Norseman went down due to the weather conditions and Morgan had no idea what he was about to fly into. Further research has suggested the plane could have gone down a short distance from Twinwood and I believe there are a couple of indications of that. If anyone is still looking for the plane and I can be of any help please email me here . 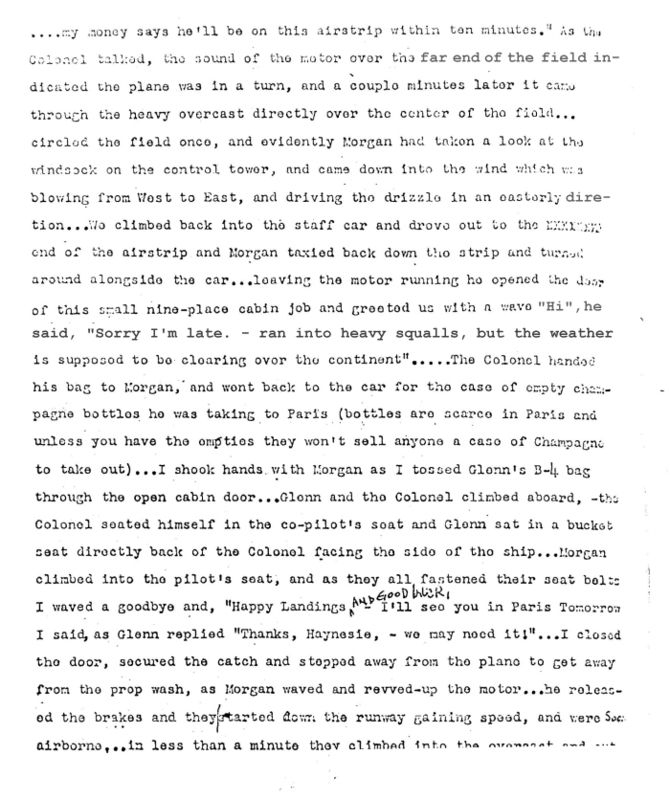 This extract from the Haynes diary (sent by the Airforce Historical Research Center in 1979) and the pages he wrote for 15 Dec were likely photo copied. He kept the diary for every day while he was in England. It's quite possible extra pages were added on to the diary as he was writing a book in 1946 or 47'. The diary was donated at sometime years after to the Airforce. This page is assumed not to have been tampered with by anyone else. Some words have been enhanced for legibilty.